Dental implantology is the science of replacing missing or damaged teeth with dental implants. Dental Implants were discovered by Prof Branemark in the early 80’s in Sweden. Since then implants have improved markedly in both their design and their ability to integrate with living bone tissue. Dental implants are made of titanium and are gaining much popularity as a predictable and effective replacement for missing natural teeth. Titanium implants are used in other areas of the human body like orthopedics and facial prosthesis. 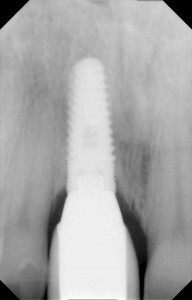 Dental Implants are small cylindrical or tapered titanium screws which similarly resemble a natural tooth root. The length, diameter and shape of the implant can vary greatly depending on the tooth which the implant is replacing. A smaller incisor tooth may need a narrower implant however a missing molar would require a more substantial wider bodied dental implant. A retired 65 year old policemen presented to our clinic for help after breaking an upper right central incisor tooth. The tooth had been restored 2 years before by a general dentist with a crown and post into the root. The crown was satisfactory however while eating on a sandwich the crown came loose. The patient returned to the dentist however the root showed signs of decay and it was not possible to restored the tooth again. It was decided that an implant was the best course of action. An implant was placed during a one stage procedure. Radio-graphs and CT scans were used to accurately plan the ideal treatment plan for the patient. 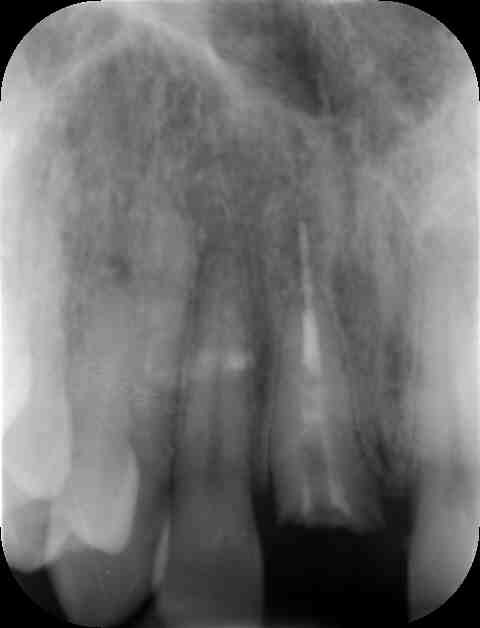 During a one hour appointment the patient had the tooth root removed under local anesthetic. The tooth socket was cleaned thoroughly before a titanium implant was carefully placed into position. The implant was secure and stable meaning that it was possible to place a provisional crown onto the implant on the same day. A single provisional implant crown was made by the chair side and loaded onto the implant shortly after the surgery. The crown was made of a temporary acrylic type material. The size and shape of the provisional crown was similar to the natural tooth crown that was there before the problems started. Four months after the surgery the patient returned to the clinic to see progress of the implant healing process. Further radio-graphs and clinical tests confirmed that the implant had been successful. 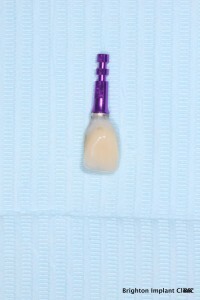 Impressions were taken of the implant for the definitive porcelain ceramic crown. 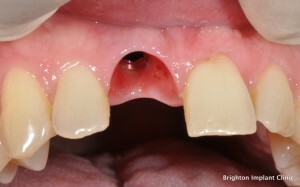 The provisional crown allowed the gum tissues to mold around the provisional tooth. This gum molding meant that the final implant crown looked natural and identical to a natural tooth. The final porcelain ceramic crown was completed 6 months after the initial surgery had started. The implant was successful and the patient was very pleased with the results. 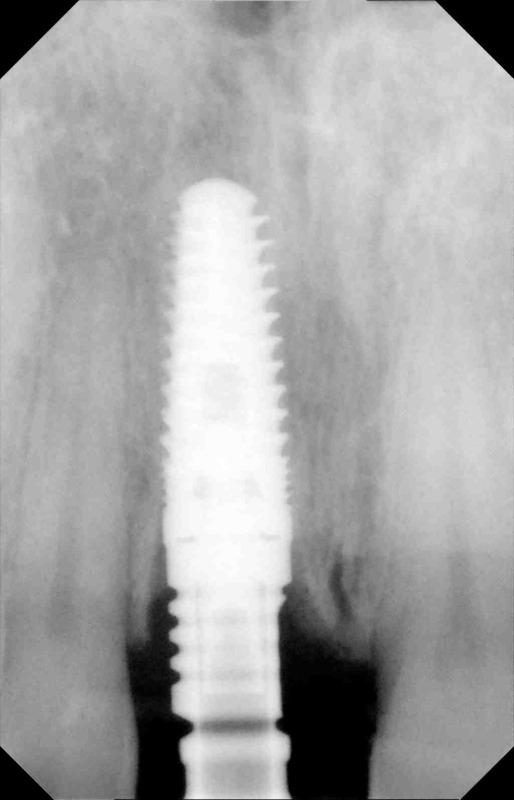 Due to the angulation of the implant it was possible to make this crown as a screw retained implant crown. Dental implantology has recently become more popular recently since prices of dental implants have lowered. At first dental implants were quite costly and meant that very few people were able to afford dental implantology and the rewards this technology offers patients. 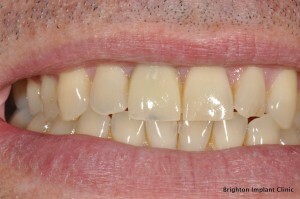 Dental implant in the UK are now more affordable thanks to clinics like the Brighton Implant Clinic. A full dental implant which includes the implant, abutment and porcelain crown costs only £995. The treatment takes a minimum of three appointments to complete. After the initial free assessment , the patient is booked in for surgery. The surgical placement of a single dental implant takes no more than 1 hour to complete. Dental implantology can be carried out under local anesthetic or sedation. The dental implant is then left in the jaw bone to heal. This healing process usually takes between 3-6 months to complete. After the healing stage, impressions are taken of the dental implant in order for a porcelain crown to be made. At the final appointment the crown or bridge is secured onto the dental implant permanently. As can be seen from this radio-graph the implant acts like an artificial root. Dental implantology is a very exciting field of dentistry. With so many patients complaining of problematic dentures or missing teeth or a combination of both, its good to know that dental implantology will be able to help. Dental implants carry a success rate of almost 95% so its a very good chance that your dental implant treatment will be successful. Brighton implant clinic is based in East Sussex with branches in Brighton, Hove and Hailsham. For more information about Dental Implantology please feel free to Contact Brighton Implant Clinic or Call us on 0800 111 6623 .